Christianity in the Roman Empire is a topical and biographical introduction to Christianity before Constantine. While its focus is the historical development of the proto-orthodox community, Robert Winn aims to bridge the gap between contemporary Christians and those who lived in the Roman Empire. To do this, his chapters discuss particular topics such as prayer, biblical interpretation, worship, and persecution, as well as prominent and controversial individuals such as Ignatius of Antioch, Justin Martyr, Melito of Sardis, and Tertullian. Part One addresses the world of the apostolic fathers, Part Two addresses hostility to Christianity and the response of Christians to this antagonism, and Part Three addresses doctrinal and communal issues of the third century. The book will pique readers' interest and provide them with a deeper appreciation for the religious identity of early Christians in the Roman Empire: what they believed and how they lived. 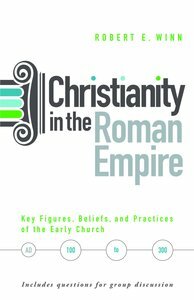 About "Christianity in the Roman Empire: Key Figures, Beliefs, and Practices of the Early Church (Ad 100-300)"